Next time you're complaining about the heat on the golf course and yearning for the respite of the halfway house, consider this fashion dictum for the active man from Edward Spencer's 1900 treatise Clothes & the Man: "...if a man is going to row hard, play tennis or take any hard exercise he should wear a soft-fronted shirt of fine flannel." Have mercy! Flannel is the polar opposite of a wicking material and the unlucky man who wore it was likely to be covered in it. Golfers and tennis players of the period were typically swathed wrist to ankle with long sleeves, long pants and even sometimes a necktie. It's time to thank the style gods that we now have sweat-forgiving action fabrics and the abbreviated classic shirt that makes it even more bearable. 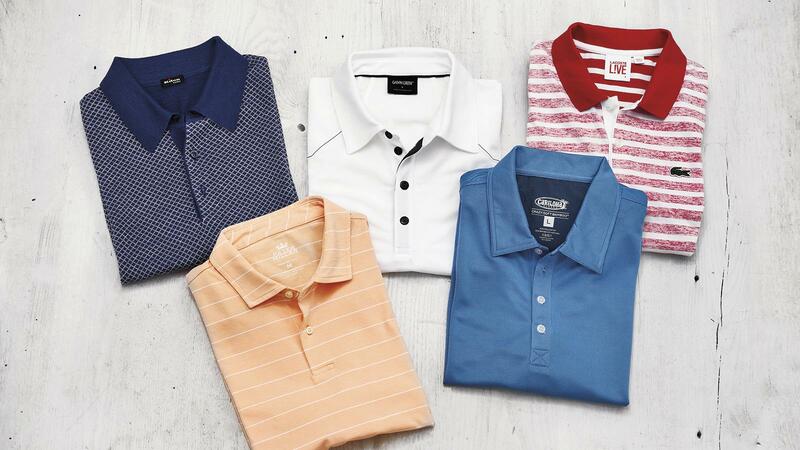 Today, the universal shirt silhouette for golfers, tennis players and any number of leisure activities is the polo shirt (even while proportionately hardly anyone wears it for that elite sport). The short-sleeve athletic shirt, with small placket and collar, was actually born from tennis. (The first polo shirts were long-sleeved, broad-cloth affairs with button-down collars to keep the flaps out of the face in the wind.) Court legend René Lacoste designed the seminal short-sleeve shirt with long back tail and a crocodile logo signifying his nickname. The form caught on, but—at tennis clubs at least—the color was originally limited to white. It was on the golf course that palette and pattern would bloom. Now, of course, wicking, breathable fabrics have caught up with the change in shape. Not only is flannel out, but modern cloth makes the shirt lighter and breezier. Galvin Green's Mason shirt in white with gunmetal details (top center, $145) comes in a fine polyester that our Mr. Spencer couldn't have dreamt of a century ago. Peter Millar's striped peach version (bottom left, $88) is 92 percent cotton with 8 percent elastant for stretch on those backswings. Cariloha's light-blue jacquard polo (bottom right, $59) introduces 60 percent polyester to 40 percent natural, durable and surprisingly soft bamboo fibers. Kiton's luxurious take (top left, $1,395) mixing 65 percent silk and 35 percent linen, is possibly the costliest polo on the market. While Lacoste's Live! in white and red currant (top right, $90) takes the cheeky stance of displaying the pattern inside out, it cleaves to the Crocodile's original material makeup: all cotton. There's still room in life for the purist. Visit cariloha.com, galvingreen.com, kiton.it/en, lacoste.com and petermillar.com.